finally, our most popular plate rack is available in money saving sets of 2, 3 or 4 racks! From our popular Augusta Collection, this plate rack features a flat black finish, regal scroll styling and is perfect for plates measuring 6.5" - 8.5" in diameter. This rack measures 16" high x 5.375" wide x 2.25" deep and has a 1.75" bracket depth. 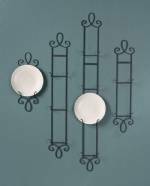 This is a beautiful and affordable plate rack!